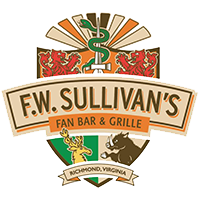 RVA #31: Hope for 2018! Young People Say Respect My Vote! The Virginia 2017 elections showed us what we already knew: Whenever young people show up, progressive values win. Those afraid of progressive values want to keep young people at home, in the dark, and out of touch with our democratic process. 2017 should be a warning sign to those who try and get in the way of the passion and power of young people. And they shouldn’t be surprised when young voters show up in droves next year to make the change we believe in. Aug. 12, 2017 was a tough day. For me personally, my Uncle Jerome Gilchrist passed away. He was a Lieutenant in the Washington D.C. Metropolitan Police Department and he had been dealing with cancer. While his passing wasn’t unexpected, it was still very painful. I heard about my Uncle Jerome’s passing while witnessing racism and hate at levels I had never seen before. August 12 was the same day Nazis walked the streets and white supremacists carried guns with the intentions of intimidation in front of my eyes in Charlottesville. It was the day Heather Heyer was killed, and two first responders also died trying to help the dozens of others that were injured in the chaos. What played out in Virginia was heartbreaking. In many ways, it also seemed like similar chaos had become commonplace on Main Street America in 2017. Some numb from all the horrific actions by the Trump Administrations, others beat down and burnt out from resisting so hard. But it was as if our country was losing grips with what it meant to be American – hope. Respect My Vote!, our award-winning voter education and mobilization program, was poised to engage thousands of young people and encourage them to make their voices heard on Nov. 7. 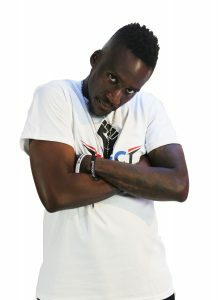 No Malice, a Virginia Beach native formerly of the acclaimed rap duo The Clipse, led a team of over 20 artists and activists from different communities throughout the Commonwealth to register young people, ensure they knew the issues, and prepare them for Election Day. When the dust settled, our team had led multiple online engagement sessions, participated in multiple radio interviews with some of the hottest DJs in Virginia, showed up at homecoming parties, and met face to face with hundreds of students on campuses to talk about why their voice and vote matter in our democracy. Virginia 2017 was an important test for our team, but more significantly, an important test for our country. It was a sweeping success for progressive values that marked a point in time when the momentum began to shift from the 2016 elections. During a seemingly dismal year and an exceedingly dark time for progressive values, people showed their passion for the issues and understanding of the importance of their vote in order to drive change. One group, in particular, showed up at the ballot box to impact the results: young people. Despite only 34 percent of young people between the ages of 18-29 turned out, young people in Virginia managed to blow the traditionally low turnout numbers for off-year presidential elections out of the water. They made the difference in the election. Heading into next year, it’s as important as ever to energize young people and make sure that they know just how important their voice is in our democracy. While the constant stream of bad news out of Washington D.C. might be exhausting, and social media memes and soundbites of Trump are starting to get old, it’s crucial young people stay engaged and focused on their opportunity to make change at the ballot box. The issues we care about – like health care, social and criminal justice, climate change, affordable education, civil and human rights, good paying jobs – are too important, and they’re all at stake. There are a lot of bad things that keep me up at night, but one of the good things is the sheer opportunity of igniting all the young people who don’t exercise their right to vote. Imagine if the other 66 percent of young people voted in Virginia 2017. Now think about igniting that kind of power, and come to grips with the fact that more millennials will be eligible to vote than baby boomers in 2018. Can you imagine why I’m hopeful for 2018? 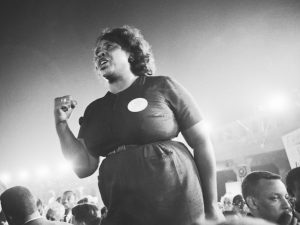 The civil rights legend Fannie Lou Hamer would be 100 years old today. While other civil rights leaders of the 20th century – like Rosa Parks and Martin Luther King Jr.- might have been the face of the movement, Hamer was certainly the heart. She was never afraid to speak her mind in the face of injustice and face the harsh consequences. She was a grassroots leader who fought for the basic rights we sometimes take for granted, including the right to vote. She was a movement inside the movement. It was people like Hamer who inspired me to travel to Charlottesville in August to stand up to hate and bigotry. It was in the Fannie Lou Hamer spirit that Heather Heyer marched in the street the day she was killed. And it is in that same spirit that we will continue pushing ahead for a better future for all. Our country is sitting at a crossroads right now. There are so many pressing issues of today – from a rise of radical white supremacists, mental health issues, drug epidemics, healthcare, immigration, criminal justice reform, to climate change – there are too many to talk about and so much to be done. The question is whether we are willing to do anything about them. Can we take our passion for the issues and turn it into real change? This fall, many of us around the country will have a chance to do so. We can vote on Nov. 7. And the Virginia elections are of particular importance. The choices made that day at the ballot box not only have drastic implications at every level of government within the Commonwealth, but they are also being seen nationally as a gauge on whether people are willing to make their voices heard following the 2016 presidential election. Non-presidential election year turnout is traditionally low, so the question is whether the citizens, including young people and communities of color, are enraged and engaged enough to make their voices heard in our democracy. Are people going to show up and vote in 2017? We know the movement to make change in 2017 and beyond is growing – and the first test just how much people care is in Virginia. My team at Hip Hop Caucus is hitting the ground running throughout Virginia. Through our Respect My Vote! initiative, we are teaming up with some of the most influential artists and young leaders across the Commonwealth to make sure people know that they have the power to make the change they are seeking. We have artists like No Malice, formerly of the acclaimed rap duo The Clipse and Virginia Beach native, leading the movement to get people registered to vote and preparing them for election day. Our grassroots network and leadership will also be out talking to young people on campuses, meeting people at concert venues, and appearing on local radio and TV shows. A key focus in Virginia this year will be reaching the 150,000+ ex-offenders who now have the right to vote. After a backwards ruling by the Virginia Supreme Court to undo automatic voter restoration for ex-offenders in July 2016, Gov. 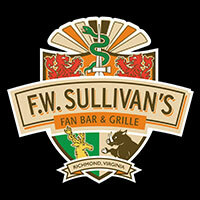 McAuliffe took bold action to re-enfranchise them. Ex-offender disenfranchisement is the only set of Jim Crow laws that has actually expanded since the Jim Crow era, making the Governor’s action to re-enfranchise these voters truly historic. One in four African Americans in Virginia who have convictions can now vote, which equates to nearly 20 percent of the African American community of voting age that are now eligible to cast their ballots. This is a big deal. From Northern Virginia, to Charlottesville, to Richmond, to Hampton Roads, this is your time to take action and exercise your most precious right. The first step is to make sure you are registered to vote. The deadline to register in Virginia is October 16, and you can easily do so by visiting RespectMyVote.com. Hamer’s spirit must live on today. We need Virginia to be that movement within the movement across America. Vote on November 7. It’s time for America to get right. About: Respect My Vote! is a non-partisan, voter registration, education, and mobilization campaign of the Hip Hop Caucus, a national, non-profit organization founded in 2004. We organize the people and institutions that create and promote urban and pop culture in order to reach, engage, and mobilize our communities, register them to vote, and empower them within democracy. Respect My Vote!’s core activities are voter registration, voter education, get-out-the-vote, and voter protection. The work, however, does not end after Election Day. Hip Hop Caucus is a multi-issue organization with a progressive agenda focused on: strengthening democracy, civil and human rights, climate change and environmental justice, and, economic empowerment. Hip Hop Caucus works to hold elected officials accountable to our issue agenda and keeps young voters engaged in the advocacy and civic process.